When electing a group of people, such as a congress, council, or committee, you need to decide which philosophy of representation that you would like to use. At a very high level, there are two basic options: proportional representation or majoritarian representation. As an example, we'll use a hypothetical election of the U.S. House of Representatives described by Daily Kos and illustrated by the diagram above. The Daily Kos article hypothesizes what the House might look like if U.S. elections used proportional representation. You can see 9 different political parties with different levels of support. With proportional representation, the percentage of seats held by a party will be approximately equal to their percent support by the voters. In this example, about 6% of voters prefer the Green party, so the Green party gets 26 of the 435 seats or about 6% of the seats. The most common voting methods that provide proportional representation are the single transferable vote (STV), party list voting, and mixed member proportional representation. STV is the only one that makes sense for non-government elections since the other two are based on political parties. OpaVote provides several variations of STV including Scottish STV, Meek STV, and ERS97 STV. With pure majoritarian representation, the party with the largest amount of support is able to win all of the seats. 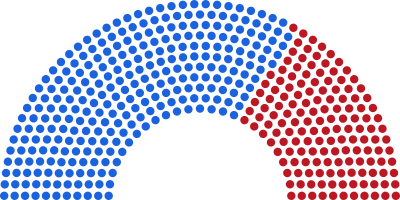 If pure majoritarian representation were used for the U.S. House of representatives, the Democrats would win ALL of the seats because that party has the largest amount of support, and this is illustrated by the diagram on the right. This seems crazy, but pure majoritarian representation is actually used by a lot of city councils in the United States. These city councils use bloc voting where each voter gets as many votes as there are positions to be filled. For example, if there are 8 members of the city council, then each voter gets 8 votes, and a majority of the population can elect every single seat on the city council. In some cities, this style of voting has been chosen to intentionally prevent racial minorities from obtaining any representation on the city council. The U.S. House actually uses majoritarian representation by districts. Each district elects exactly one member, and the majority of the district elects the member. Because the demographics of every district are different, some districts may have a majority of Republicans and others may have a majority of Democrats. Only two political parties are viable and this is why third parties in the U.S. are not able to get traction. You must vote for the lesser of two evils to prevent the worst candidate from winning. The results are often very unproportional. For example, a party with support of 51% of the voters may control 65% of the seats or may control 40% of the seats. Political parties can use gerrymandering to great advantage. A party with support of 51% of the people can easily gerrymander district lines to ensure that they win nearly all of the districts. For most organizations, we believe that proportional representation is the better choice because it allows all views to be heard and considered. Ignoring minority views of your organization may cause those people to leave and form their own organization. OpaVote provides several versions of the single transferable vote, which makes it very easy for your organization to elect its councils, boards, and committees using proportional representation. There are some instances where it makes sense to use majoritarian style of voting, and we'll present a couple examples. Some organizations elect a President and a Vice President with a single IRV ballot. The ballots are counted with IRV to choose the President. Then, the winner is removed from the ballots, and the ballots are recounted to choose the Vice President. I call this process majoritarian IRV because a majority of voters can elect both the President and Vice President. This mimics having two separate elections for President and Vice President but allows both to be elected with a single ballot. Elections that are reducing a number of choices to a smaller number for an eventual selection of just one winner are also a good candidate for majoritarian representation. One OpaVote customer selects a city for a worldwide meeting this way. A first election is used to reduce an initial list of 10 cities down to 3 cities using majoritarian IRV. Later, a second election is used to select a single city. Since the end goal is to select a single city (which is necessarily a majoritarian decision), it makes sense to use majoritarian voting to reduce the list of 10 cities down to 3 cities.